Most of us are not thrilled about fasting – which part of the struggle we all confront when we begin a fast. How do we joyfully and thankfully approach fasting? How do we prepare ourselves to receive Christ into the manger of our souls? How can the Mary be a guide to us this Advent? In this episode I will draw on the wisdom of St. Gregory Palamas and the life of Mary, even before her conception, to help us prepare for the Advent Fast. “The invisible serpent, the originator of evil, is inventive, versatile and extremely skillful in contriving wickedness (with regards to any attempts to acquire virtue, which is part of the reason why we fast. )… First of all he points out how laborious and difficult it is to accomplish virtue. In this way he fills us with laziness and despair, as though we were attempting difficult to impossible things and were therefore incapable of putting our intentions into action. Then he engenders disbelief in the rewards, which God has promised to those who struggle. Here God is using the devil to test our resolve and commitment. But we, brethren, should rise above these traps by our soul’s courage, eagerness and faith. We should bear in mind the fact that just as the earth cannot yield worthwhile fruit without labor so the soul cannot acquire anything, which pleases God or leads to salvation, without spiritual struggles. The last 2 podcasts I did on The Dance between Temptations and Grace addressed this very subject. One cannot earn grace without surmounting temptations with God’s help. “In this time of fasting and prayer, Brethren, let us with all our hearts forgive anything real or imaginary we have against anyone. May we all devote ourselves to love, and let us consider one another as an incentive to love and good works, speaking in defense of one another, having good thoughts and disposition within us before God and man. In this way our fasting will be laudable and blameless, and our requests to God while we fast will be readily received. We shall rightly call upon Him as our Father by grace and we can boldly say to Him, “Father, forgive us our debts, as we forgive our debtors” (Matt. 6:12). It is important for us to fast according to our conscience and strength, relying not on our strength, but God’s or our attempts to fast from certain foods and passions will fail miserably. So let us turn to the life of the Mother of God to see how even before her conception, her life can be a guide to us in finding our right disposition this Advent fast. “Fear not Joachim, I am the angel of the Lord and have been sent by God to tell thee that thy prayers have been heard and thy charitable deeds have gone up into His presence. God has seen thy shame and has heard the reproach of unfruitfullness, which has been unjustly brought against thee; for God is the avenger of sin, not of nature. Thy prayers have been heard – Let us begin this Advent fast asking in our prayers for God to help us. We want conceive purity in our hearts and souls – to prepare our souls to receive Christ more fully through our humble attempts to keep the fast. Thy charitable deeds have gone up to His presence – Let us be charitable during Advent to those around us by our manner of being and giving. God has seen thy shame and has heard the reproach of unfruitfullness – God has seen our shame – He knows we have often fallen short of the mark – that unseen adversaries persecute us and afflict us, and our passions take us away from Him. But with God anything is possible! Let us believe that it is never too late to make an effort for the Lord – and that effort will help us conceive something wonderful in our soul. According to our promise – we will strive to uphold the fast so that we too can be filled with the Holy Spirit! “Mary shall not eat or drink anything unclean, nor shall her conversation or life be among the crowds of the people, but in the temple of the Lord, that it may not be possible to say, or so much as to suspect, any evil concerning her. Let us do our best to fast, not just from food, for some of us due to age or health issues cannot observe a strict fast, but we can guard our tongue, refrain from the passions, give alms to others, and be in church or in prayer at home more frequently. …So in the process of her years, Mary shall be in a miraculous manner born of one that was barren, so she shall, while yet a virgin, in an incomparable manner, bring forth a Son of the most high, the Savior of all nations. So in a miraculous manner we too can receive the overshadowing of the Holy Spirit and bring forth Christ in the manger of our souls. We too by our efforts during this Advent can attract the grace of God to us. 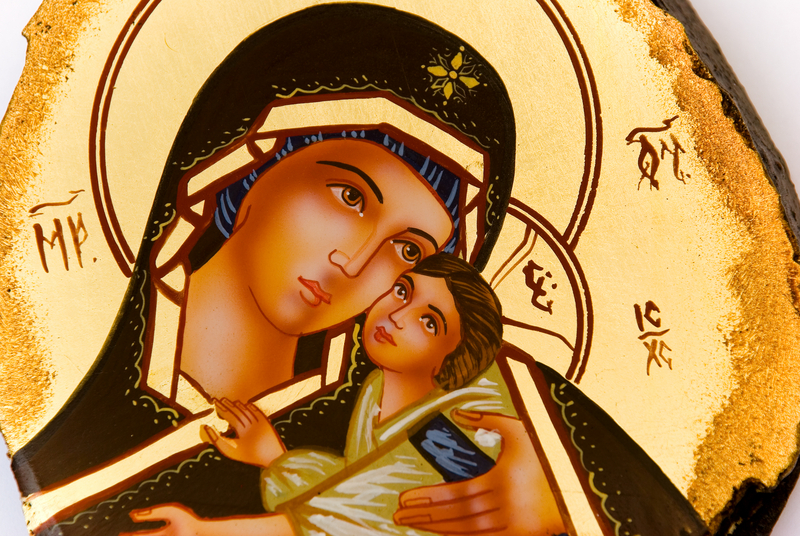 To draw closer to the Mother of God and Jesus in prayer this Advent I want to extend an invitation to all my listeners to join me praying either an Akathist or Canon to the Mother of God during the Nativity Fast. I found a lovely download of both the Akathist to the Mother of God and to Jesus for only $7.95 on Orthodox Christian Recorded Books, http://www.ocrb.org/, that I plan to use to help me fulfill my prayer commitment. “Let us ascend to the Holy Mountain,” wherein it is written that St. Dionysios went to Jerusalem while the Theotokos was still in the world… As he beheld her divine appearance and awesome beauty, and also the choir of angels that guarded her, and as he heard her heavenly words, he was astonished and awestruck, and admitted that everything about her indicated she was the Mother of God. Thank you for joining me and have a blessed start to Advent and Happy Thanksgiving.